* Failure to build the kernel modules in open-vm-dkms for HWE kernels impedes guest configuration, host/guest file system, desktop copy buffer sharing, etc when running a Precise VM on a VMWare host. * This SRU focuses on HWE support for VMWare's vCloud Hybrid Service (vCHS) which requires open-vm-tools from the upstream stable stream (in Trusty) and the 3.9 kernel. * Upstream changes only available in the mainline kernel modules and the 9.4.x stable series of open-vm-tools are required to support VMWare's vCloud Hybrid Service (vCHS). * open-vm-dkms fails to build its kernel modules for open-vm-tools on Precise. * Kernel modules affected include vmc_vmci and vmc_vsock both of which are host/guest communication. They are used for guest configuration, host/guest file system, desktop copy buffer sharing, etc. * This version of open-vm-tools is not supported by upstream or Debian. * The modules which fail to build have been merged upstream, with the exception of the host-guest file system (hgfs) module (host <-> guest access must be provided with a remote FS such as CIFS or NFS). These modules are available in v3.9 of the kernel and later (Saucy and later). This vmware knowlegebase article (2073804 http://kb.vmware.com/selfservice/microsites/search.do?language=en_US&cmd=displayKC&externalId=2073804) maps out when each driver landed upstream but kernel 3.9 includes everything. * open-vm-tools in Debian testing/unstable and Trusty are based on the stable 9.4.x release from upstream. * The upstream kernel modules and open-vm-tools have received enhancements to support vmware's vCloud Hybrid Service (vCHS) which are not available downstream. 1) back-ported the version of open-vm-tools in Trusty as a separate HWE package (open-vm-tools-hwe). * It will not be an upgrade target (does not contain "provides: open-vm-tools") but would require manual installation along with an HWE kernel from Saucy or later. The newer package will not regress open-vm-tools as it exists in Precise. * The open-vm-tools for Precise based on the 2011.12.20-562307 development snapshot can still be maintained by the community to support Precise with the stock kernel. 2) updated the open-vm-tools package in Trusty to replace the open-vm-tools-hwe packages created by this change. * Install Precise with GA packages in a vmware host. * On Precise GA kernel the modules will build. * Copy text on the host desktop and attempt to paste into a terminal on the precise guest. This, and the reverse, should work. * Drag a file from the file manager on the host to the file manager on the precise guest. This, and the reverse, should work. * Upgrade the guest to the current Precise kernel or a new HWE kernel. * Copy/paste and file drag-and-drop will not function. * Additionally, zero-config of the guest from the host, necessary to support vCHS, and memory ballooning will also not function without the fixes. There is a large delta between this development snapshot in the Precise packages and this stable release package. Were this package to replace the package in Precise there would be a high risk of regression. This is mitigated by introducing the back-port as it's own new package. This package does not provide open-vm-tools-*, only open-vm-tools-hwe-*, so that the original package is still available and this new package is only installed through manual selection by informed users. * The development snapshot in precise is unaffected by the addition of this new package. My intention is to create this 'hwe' package for use with a 3.9 or later kernel to provide support for new virtual hardware enablement of the vCHS cloud. This will allow it to live alongside the open-vm-tools for the precise kernel. open-vm-dkms 2011.12.20-562307-0ubuntu1 has issues with newer kernels than 3.2. Can this package be updated whenever a new backport kernel is released? I need to check the trusty patch again to see if I should be including 'Conflicts:' directives for the open-vm-tools-hwe[-*] packages. I'll update this bug again once I have double checked that absolutely everything is cleaned up on upgrade. The attachment "New open-vm-tools-hwe package for precise HWE support" seems to be a debdiff. The ubuntu-sponsors team has been subscribed to the bug report so that they can review and hopefully sponsor the debdiff. If the attachment isn't a patch, please remove the "patch" flag from the attachment, remove the "patch" tag, and if you are member of the ~ubuntu-sponsors, unsubscribe the team. Robert, what are HWE kernels on Precise? Which of these metapackages will install a HWE kernel? Robert, if you introduce a new package to Precise can you also make sure that there is a transitional package in Trusty? > Robert, what are HWE kernels on Precise? > Which of these metapackages will install a HWE kernel? All of those install an HWE kernel, you want Saucy or later. A kernel which is v3.9 or later is required for functionality in these patches and I will clarify in the package description with an update to the patch attached here. I suggest Saucy as of today because it is the supported LTS kernel in Precise as per https://wiki.ubuntu.com/Kernel/LTSEnablementStack#Kernel.2BAC8-Support.Ubuntu_Kernel_Support. The Trusty LTS kernel for Precise is in early preview as of today and will not be supported until 12.04.5 according to that web page. To make things easier, there is a single meta package you can use to point to the latest HWE kernel, linux[-image]-hwe-generic. Sadly, that package is still pointing to Quantal but I have opened bug #1319471 to correctly point the linux[-image]-hwe-generic packages to linux[-image]-generic-lts-saucy. Hopefully that can be resolved by the time this package becomes available and we'll have simpler guidance on which kernel to use. > Robert, if you introduce a new package to Precise can you also make sure that there is a transitional package in Trusty? The second patch does just that, it updates the trusty open-vm-tools packages to provide transitional packages and make for a smooth Precise to Trusty upgrade. 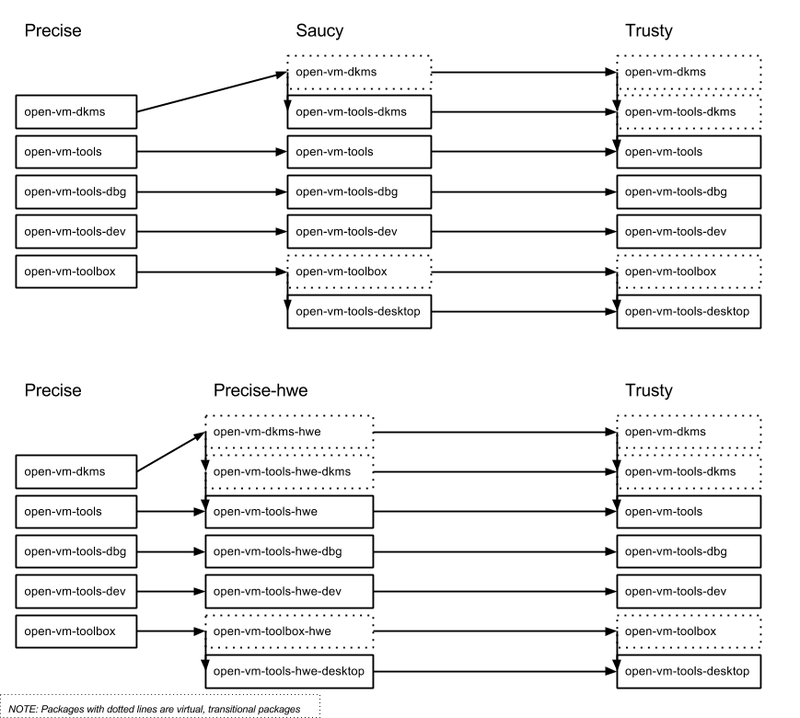 Attaching a diagram to outline the changes here and the upgrade path to Trusty. The packaging is a bit complex due to the fact that some packages upstream are virtual packages and this new package in Precise is bridging the two. Is it correct that 'linux-hwe-generic' should then always depend on the latest supported 'linux-generic-lts-*' package? Also will 'open-vm-dkms-hwe' then at least suggest 'linux-hwe-generic'? Just for confirmation... The current 'open-vm-dkms' in Precise would not change because of this change. This means people will need to manually install 'open-vm-dkms-hwe' and a newer kernel. Correct? Attaching a debdiff to update open-vm-tools in trusty so that it replaces open-vm-tools-hwe upon upgrade from precise. Uploaded for P/T, note this will also sync to U. We want to drop this in U, so when U gets merged next please exclude these patches. The patches needed to be updated because the package for Precise needed to have it's version corrected. At the same time I changed the naming from open-vm-tools-hwe to open-vm-tools-lts-trusty as suggested by Stephane. Just a note that this is currently uploaded to universe but this package has been through a MIR with trusty prior to backport to precise. So we'd like to request that this be in main for precise. I plan on speaking with foundations on Monday for review. review from the foundations team. Thank you. > Cloudware, which is subscribed to the bug report. > * Failure to build the kernel modules in open-vm-dkms for HWE kernels impedes guest configuration, host/guest file system, desktop copy buffer sharing, etc when running a Precise VM on a VMWare host. > * This SRU focuses on HWE support for VMWare's vCloud Hybrid Service (vCHS) which requires open-vm-tools from the upstream stable stream (in Trusty) and the 3.9 kernel. > * Upstream changes only available in the mainline kernel modules and the 9.4.x stable series of open-vm-tools are required to support VMWare's vCloud Hybrid Service (vCHS). > * open-vm-dkms fails to build its kernel modules for open-vm-tools on Precise. > * Kernel modules affected include vmc_vmci and vmc_vsock both of which are host/guest communication. They are used for guest configuration, host/guest file system, desktop copy buffer sharing, etc. > * This version of open-vm-tools is not supported by upstream or Debian. > * The modules which fail to build have been merged upstream, with the exception of the host-guest file system (hgfs) module which has been replaced with an hgfs FUSE helper. These modules are available in v3.9 of the kernel and later (Saucy and later). This vmware knowlegebase article (2073804 http://kb.vmware.com/selfservice/microsites/search.do?language=en_US&cmd=displayKC&externalId=2073804) maps out when each driver landed upstream but kernel 3.9 includes everything. > * open-vm-tools in Debian testing/unstable and Trusty are based on the stable 9.4.x release from upstream. Accepted open-vm-tools-lts-trusty into precise-proposed. The package will build now and be available at http://launchpad.net/ubuntu/+source/open-vm-tools-lts-trusty/2:9.4.0-1280544-5ubuntu6~precise1 in a few hours, and then in the -proposed repository. Accepted open-vm-tools into trusty-proposed. The package will build now and be available at http://launchpad.net/ubuntu/+source/open-vm-tools/2:9.4.0-1280544-5ubuntu6.1 in a few hours, and then in the -proposed repository. Regarding the missing build dependency, libdumbnet-dev, in main. This package was promoted from universe to main for Trusty, the MIR is in bug #1220950. 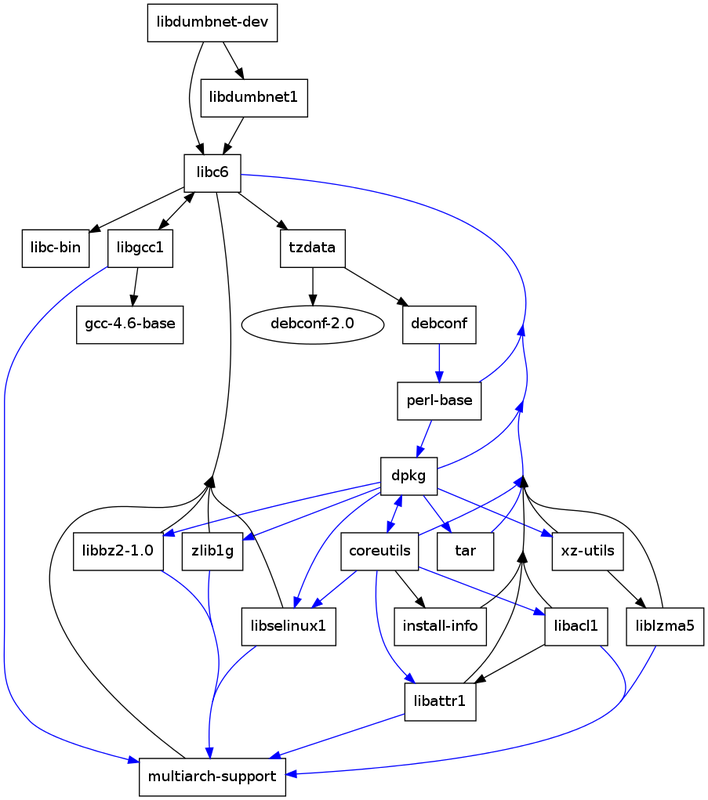 The only dependency for libdumbnet-dev or libdumbnet1 is libc6 which is already in main. Opened bug #1326025 to SRU libdumbnet changes from trusty back to precise prior to moving that package into main. Accepted cunit into precise-proposed. The package will build now and be available at http://launchpad.net/ubuntu/+source/cunit/2.1-0.dfsg-9build1 in a few hours, and then in the -proposed repository. Sorry for the mess, just added a cunit task for the no change rebuild required to get it moved to main. As far as testing is concerned, building open-vm-tools-lts-trusty against it should be sufficient to check that it works as expected. Verified functionality with open-vm-tools-lts-trusty on precise. Upgrade from open-vm-tools to open-vm-tools-lts-trusty on precise worked fine. Copy/Paste buffer sharing and file drag-and-drop between host and guest work. Verified upgrade from open-vm-tools-lts-trusty to open-vm-tools when moving from precise to trusty. I started with a clean trusty installation, removed its open-vm-tools package, changed the apt sources to point to precise with -proposed, installed open-vm-tools-lts-trusty, then switched apt sources back to trusty and performed a dist-upgrade. The other piece that is missing is that zerofree needs to be SRU'd to main as well. Otherwise, open-vm-tools-lts-trusty won't install purely from main. package is recommended but not required. causing problems. Or just promote zerofree is no one cares. Marking as verification done. I had failed verification erroneously and I have re-verified to make sure this is correct. I had previously failed this due to an install failure for a 3rd party package from VMWare, thinking that the problem was in the control file for this new package in precise. After a bit of testing and education I have learned that the 3rd party package is requiring open-vm-tools and specifying a particular version range. The virtual package in the backport can't satisfy specific version requirements so the 3rd party package must be updated with knowledge of the new open-vm-tools-lts-trus-needed-trusty package. With that resolved and the packages re-verified I have set the tags and distribution/package status so that these can be promoted from -proposed. I've also verified this. Everything looks good from my perspective. I tried to test this and couldn't get it to work, though I may have done something stupid. I run precise, and upgraded to the lts-trusty kernel. I then removed open-vm-tools (& friends), and inserted the custom built precise package. That all worked fine, but I still can't mount vmhgfs as I did before I did the kernel upgrade in the first place (more precisely, my /etc/fstab line worked, whereas now the system still hangs on boot until I press 'S' at the console). I note the above says "The modules which fail to build have been merged upstream, ***with the exception of the host-guest file system (hgfs) module which has been replaced with an hgfs FUSE helper***. These modules are available in v3.9 of the kernel and later (Saucy and later)" (my emphasis). That rather implies that the FUSE helper is now included within the package(s). If so, how do I use it as the previous syntax does not appear to work. If not, how does one get the FUSE helper? Further playing about suggests I need (somehow) vmware-hgfsclient, but the package seems devoid of any documentation or manual pages. The description text was not up to date and I am correcting it. When the kernel modules from the dkms package were taken to the Linux kernel community the vmhgfs module was not accepted and vmhgfs is no longer supported. The current options for file access between the host and guest would be standard remote file systems such as CIFS or NFS. Additionally, file drag-and-drop is functional and provided by open-vm-tools-lts-trusty-desktop. That's a shame, but thanks for the info. Failing the verification. Installing open-vm-tools-lts-trusty does not include /etc/init.d/open-vm-tools, which means that the services don't automatically start. Accepted open-vm-tools-lts-trusty into precise-proposed. The package will build now and be available at http://launchpad.net/ubuntu/+source/open-vm-tools-lts-trusty/2:9.4.0-1280544-5ubuntu6~precise2 in a few hours, and then in the -proposed repository. Marking as verification done. I've confirmed that the last patch fixes the packaging issues and that the daemon now runs. The verification of the Stable Release Update for cunit has completed successfully and the package has now been released to -updates. Subsequently, the Ubuntu Stable Release Updates Team is being unsubscribed and will not receive messages about this bug report. In the event that you encounter a regression using the package from -updates please report a new bug using ubuntu-bug and tag the bug report regression-update so we can easily find any regresssions. Accepted open-vm-tools into trusty-proposed. The package will build now and be available at http://launchpad.net/ubuntu/+source/open-vm-tools/2:9.4.0-1280544-5ubuntu6.2 in a few hours, and then in the -proposed repository. I have verified the trusty package in proposed (open-vm-tools 2:9.4.0-1280544-5ubuntu6.2). * Upgrade from the precise-proposed packages worked correctly. * Upgrade from the trusty 2:9.4.0-1280544-5ubuntu6 version worked as well. How do I download the fix? I am using a fresh install of "Securityonion-12.04.5-20140908" and still receive this crash report after updating Ubuntu as of 1/31/2015.